Before I get started I wanted you to see this Shun and the severe, catastrophic damage to the edge. I don't know what happened but it could be a simple twist of the blade while it was embedded in something semi frozen or a squash or something. Not always a sign of abuse, usually, but not always. I will have the after shot later in this post. Professional sharpeners and likely all folks serious about the process very likely think about edge retention, how to get your knife/knives to stay sharp as long as possible. It is something I have agonised over for years and worked very hard at. 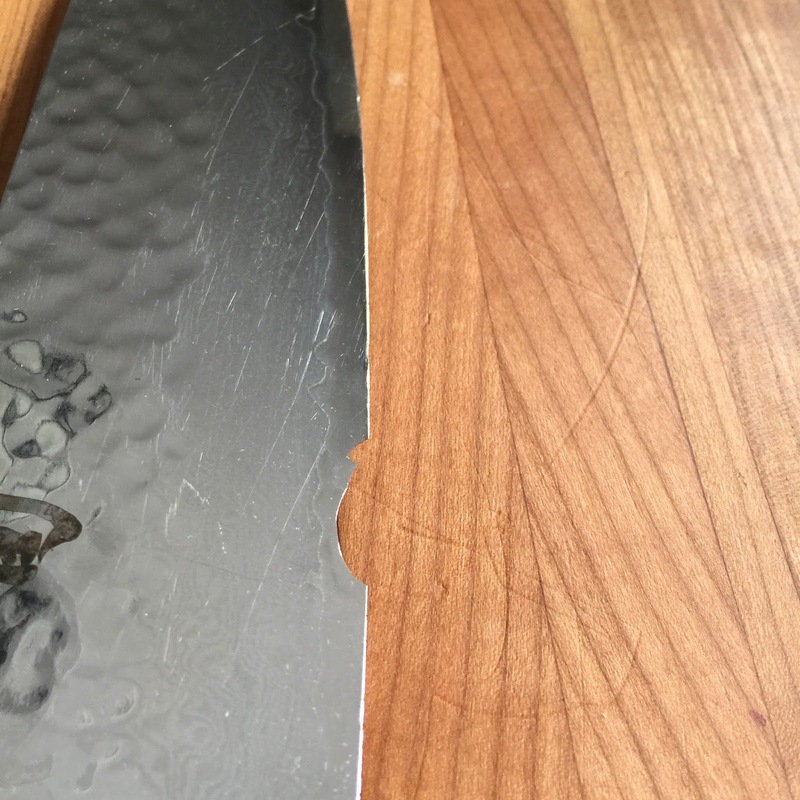 I sincerely put all my efforts into creating edges on kitchen knives used in professional kitchens that would retain a good working edge for as long as possible. In almost every case it ended up in frustration for me until I learned a few things and I have since come to an important realisation. 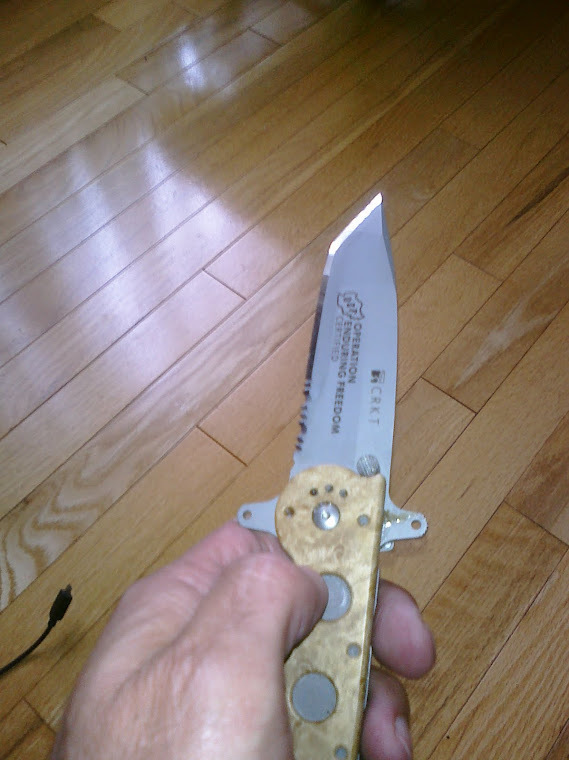 Here is what happened: I would do my due diligence and create an edge taking into account the steel in the knife I was given to sharpen, the work environment and with hope that if I did my part, the owner of the knife would do his. In my opinion, Edge Retention is a team effort, my responsibility lies in thinking ahead and building a strong edge, sharp of course but also strong. In other words, if I just wanted to impress the hell out of someone I could take their 40 dollar chef knife and sharpen it at 15 deg or less and make it truly razor sharp. However, the edge would fail very fast, on day one perhaps (I have tested this of course) and this serves no purpose. So I would sharpen it at an angle as close to 20 deg per side as possible and make it as sharp as I possibly could. This went on for a number of years and in one particular case, "the eye opener" I heard that the knives were not staying sharp for more than a week. So I went through the trouble of making test knives, similar knives sharpened/finished at different grits but the angles were pretty much the same. Then I realized that this was a waste of time, the people using the knives in some cases didn't really care too much about them, they were not their knives so they didn't make much of an effort to protect the edges, and worst of all, they would steel them very roughly and knock the edge off immediately. This went on for a bit, any attempts at enlightening them were fruitless, it was my fault in their eyes. (I no longer sharpen for them). This was never the case for an entire kitchen staff, but in my business it just takes one individual to form an unfounded and inaccurate opinion to set the stage for future issues. Also, folks are terribly busy in kitchens, and despite their good intentions, edges slip away so to speak, it doesn't take long and we are not talking about cutting up 5 onions and 5 potatoes, it's 50 of those. Here is the deal and again, this is just my opinion. 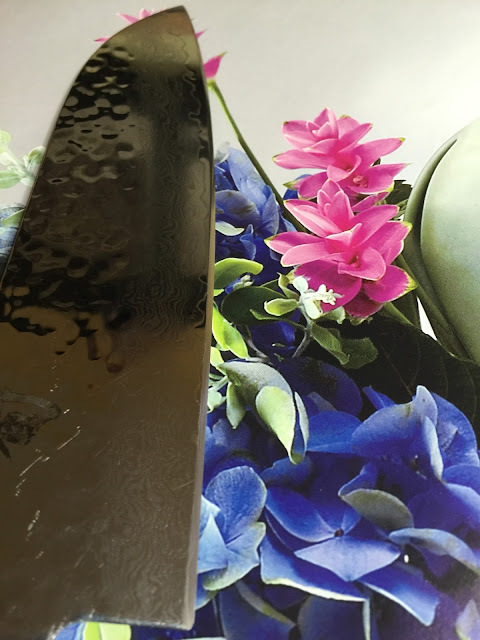 A lot of effort has been made by talented people to test knives and examine edge retention in attempts to squeeze the last piece of sharpness out of the knife. HOWEVER, these tests are done in controlled environments, the knives I sharpen, your knives, do not operate in a controlled environment where someone is cutting something the exact same way over and over. In the real world, many of knives I sharpen, especially in busy kitchens are used by different people, they cut a variety of different things and are placed into a dishwasher. In the meantime they are subjected to steel abuse by a user attempting to "sharpen" the knife with that ridiculously poor poor process that we often see on TV. How can that possibly re-align and edge, the entire edge from heel to tip? Picture placed to add a little something other than just text. 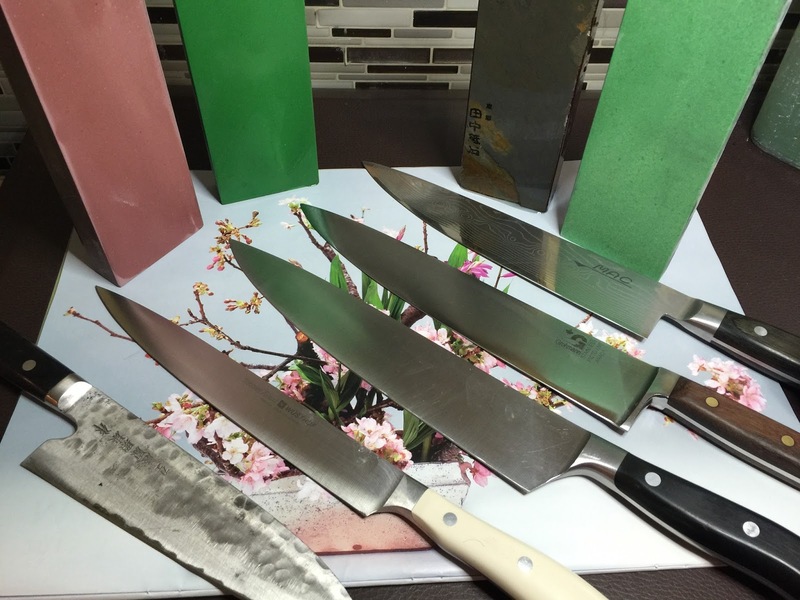 These are nice knives that belong to an extremely talented Chef. * Do not steel it if you are not going to do it properly, with focus and knowledge of what it is that you are trying to do. Forget what you see them do on TV. The best solution is to make Edge Retention a moot point by either having it sharpened once a month or using a better maintenance program. The best to way to maintain an edge is to use a medium to fine grit water stone, think of it as a rectangular hone and use trailing strokes and light to medium pressure. Allow the abrasive properties of the 2,000 grit stone for example to gently remove the fatigued metal that is hindering the knifes performance. (A steel, even when used properly is merely pushing fatigued metal back and forth). If I was a chef, I would hope that I would have a nice 2-5k stone right there at my work space and out in the open, a constant reminder of what it's purpose is. Every day before I went to work I would take every knife I plan to use and with gently trailing strokes and at the same angle the knife was sharpened at I would hone those knives to sharpening perfection. My thoughts of edge retention would fade away in the knowledge I was doing wall I could to ensure that every cut I made that day was with a razor sharp knife. 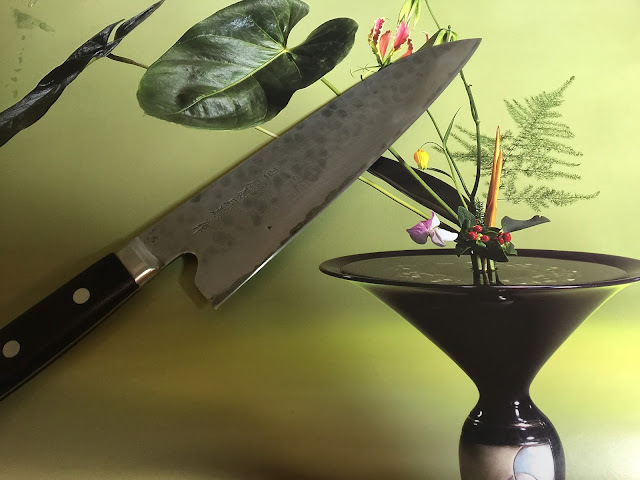 Now I completely understand that chefs are busy folks, hectic work, long hours, brutally busy but I don't believe there is an excuse for a chef to use a dull knife. I don't meant it has to be beyond razor sharp, it has to be at the level where everything being prepared is done so effortlessly in terms of the knife. My role in Edge Retention is now to educate folks on how best THEY can keep their knife sharp, I will do my part but the rest is on you folks. I can tell you that in every case, for the restaurants that I sharpen for that did NOT steel their knives but called me in every 4-6 weeks, their knives are sharper, in every case. 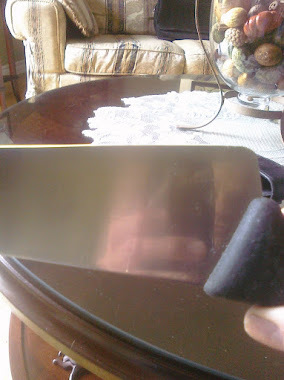 Here is the Shun after I repaired it. 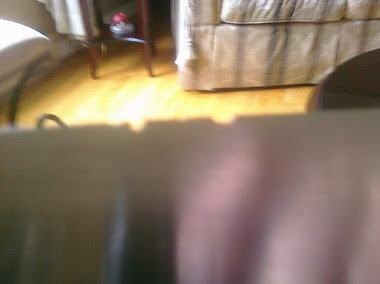 It was a lot of work, the New Edge is now up into the thicker part of the blade so I had to really thin it out, knock metal off of the secondary bevel to leave the knife with it's correct cutting performance in tact. I know that some folks enjoy my Blog, that really means a lot to me, keeps me inspired. This is a really nice save. Cool!